EZ Contracting refers to our building by number 1 - 12. 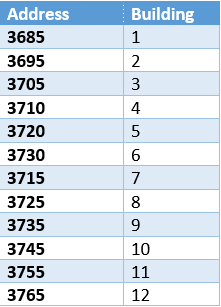 Below is the list of how our addresses translate to their numbers. Buildings 1 - 6 are just about done. The scaffolding is down, and there are a few finishing touches to be completed. Buildings 7 - 9 are underway. Tile is being installed and good progress is being made. Buildings 9 - 12 are next. We are almost there! The initial work on the buildings at the pool end of the street should be finished by the end of this week. From the cul-de-sac end of the street the first 3 buildings have passed inspection by Collier County. Tile placement will begin on the first two buildings early next week. Our project is progressing at breakneck speed! Our contractors are doing a great job and I think everyone is happy with the progress. Starting Monday, March 19, our next phase will begin with Capstone Environmental. They will be here conducting the interior inspections of all 96 units to test for mold, moisture and any windoes or doors that may have been compromised. Please help us by allowing access to your unit to complete this part of the project. We have engaged the firm of Harvey Cohen, insurance claims specialists who will be inspecting our properties in an effort to negotiate additional damage losses for all 12 buildings. We hope this will benefit everyone as we move towards project completion. Our Landscaping Committee is busy reviewing options we have regarding replacement trees and plantings as per the engineering drawings and specifications. We will post start dates on the plantings as soon as they become available to us. The painting job is back on hold until the roofers are done. This may mean that the Lanai work will not start on 5/25. In the meantime, it’s fine to go ahead and submit your Lanai work requests and payment to Mario's. Mario’s is still going to be doing the work. The painters will be completely covering and taping off anything that should not get painted, including windows, screens, hurricane shutters, light fixtures, building and unit number plaques, etc. but you are responsible for not parking in the driveways during power washing and painting, and removing everything from your lanais. Click the link below to download the Lanai work form. Select your options, write your check and mail to Mario's by May 25, 2018. Please remember bring your cans in by 7:00pm. Do not leave them out for days after pickup. They can be placed curbside after 5:00pm the day prior to pickup. It is a Collier County Ordinance that all dogs be leashed while being walked.